Few things convey as much freedom and self-sufficiency as being able to drive a car. And especially in Southern California, driving can be more of a necessity than a luxury. As we age, however, our driving abilities may change. 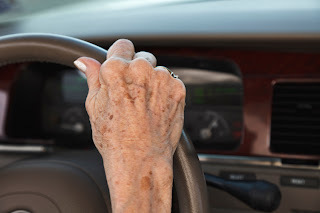 To minimize safety risks to ourselves and others, it’s wise to understand how aging affects our driving and learn strategies that can help us continue driving well into our senior years. According to the Automobile Association of America (AAA), seniors are safe drivers compared to other age groups because they wear seatbelts, observe speed limits, and tend to avoid drinking and driving. Mobility may also be affected. For example, neck pain or stiffness can impair being able to look over your shoulder. Leg pain might make it difficult to move your foot from the gas pedal to the brake pedal. Medication can also impact driving performance. More than 75% of people over age 65 take at least one medication. Leave enough space between your car and the car in front of you. Scan far down the road continuously so you can anticipate future problems. Minimize distractions inside your car, such as music volume. Plan your route before you get in the car. Minimize left turns. Drivers age 65 and older are disproportionately involved in crashes involving left-hand turns. Use designated left-hand turn lanes, or make three right turns to avoid making the left. Try to avoid busy highways and congested traffic. Consider getting a car with reverse monitoring and back-up cameras, blind-spot warning systems and other crash-avoidance technologies. There may come a time when it’s no longer safe to remain behind the wheel. “Indications that it’s time to stop driving include getting lost on roads you should know, being told repeatedly by passengers that you missed a stop sign or finding scrapes on your car that you weren’t aware of getting,” says AARP’s Beringer. If you are concerned about someone else’s driving ability -- for example a parent’s -- join your parent as a passenger for several trips and at different times in order to get a good sense of his or her driving performance. Encourage your parent to check his or her skills by taking a self-rating program (such as this one from the Automobile Association’s Foundation for Traffic Safety) or getting assessed by a professional such as a doctor, rehab clinic or geriatric care service. Using local public and private transportation options. Try out these services with your parent in order to determine which are convenient and easy to use. Offering to do the driving yourself. Hiring a trusted friend or neighbor who needs a little extra cash. When possible, broach the subject before the need arises. Try to come up with a “game plan” you and your parent can agree on ahead of time. And be empathetic: You wouldn’t want to lose your ability to drive, and neither does your parent. Keep the focus on your parent remaining safe while still getting where he or she needs to go. Nancy Sokoler Steiner is a freelance writer and author based in Los Angeles. Her work has appeared in Los Angeles Times Magazine, The Jewish Journal of Greater Los Angeles and Lifestyles Magazine, among other publications.